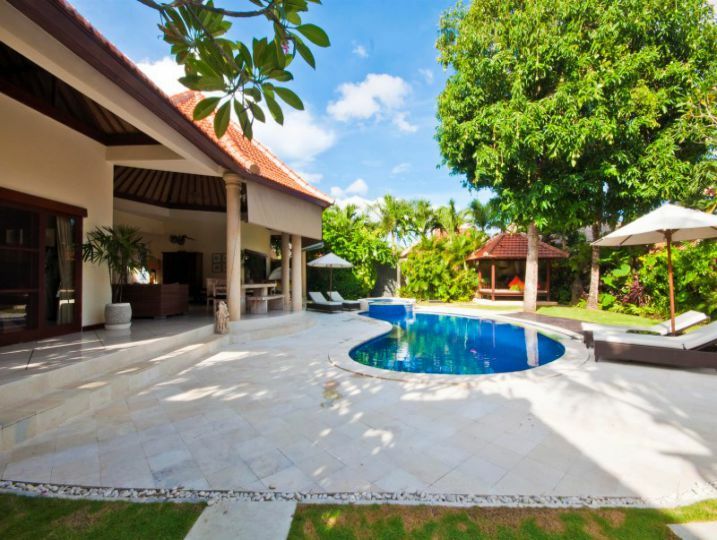 Staying in a private villa at the center of one of Bali’s most sought after neighbourhoods gives visitors to this magical island the best of both worlds: Comfort, service and relaxation within, and beyond the walled garden are a dazzling range of holiday experiences. 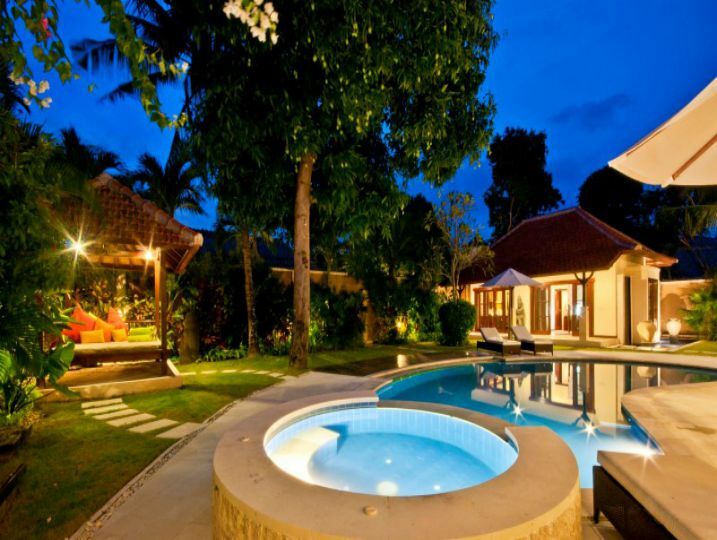 All this awaits guests at These villa. 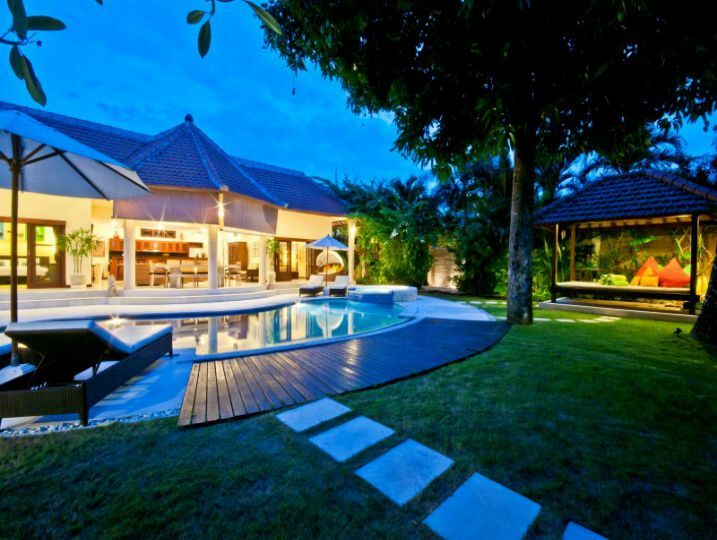 This property is situated on a small lane adjacent to the main road in Seminyak that has the best in dining, shopping, art galleries, spa services, beach-front and nightlife. 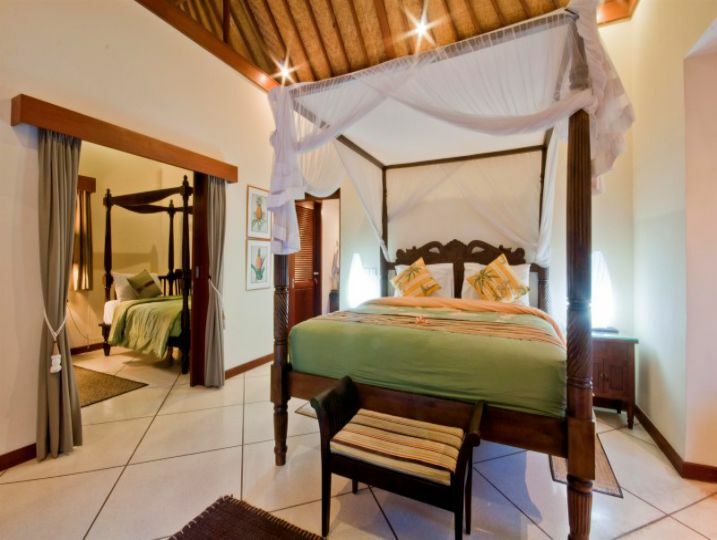 The Villa offers three well appointed air-conditioned bedrooms. 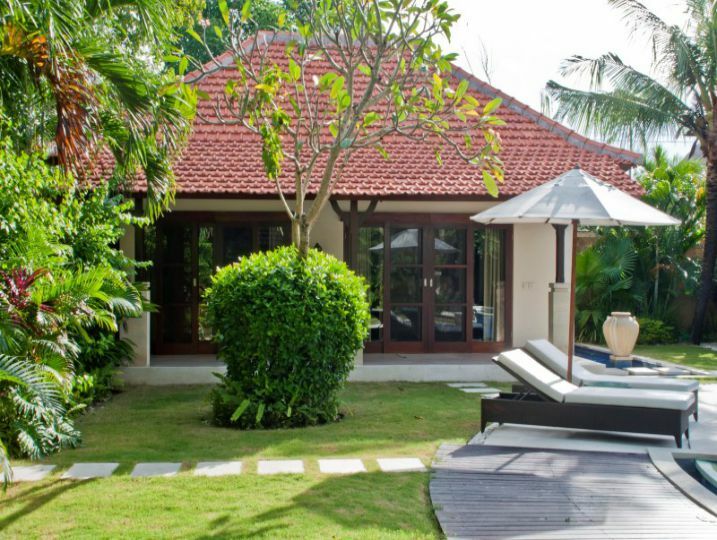 The two king-size doubles flank the main building and the twin single sits as a separate bungalow facing out to the garden. 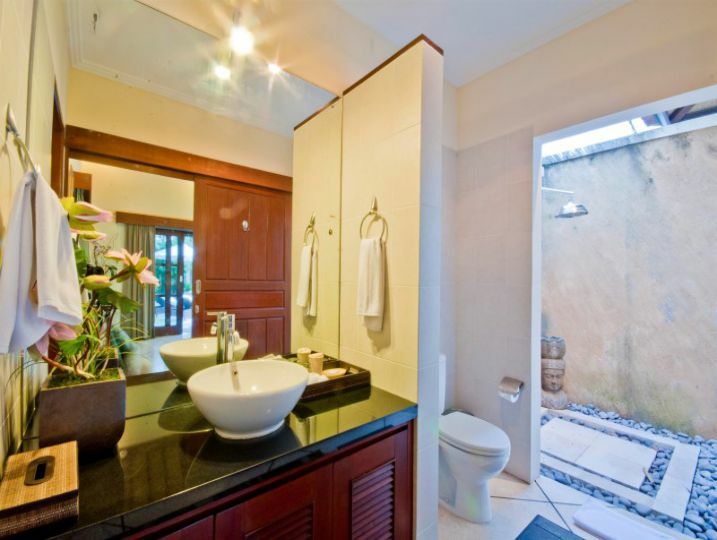 All rooms have en-suite bathrooms with bathtubs, twin sinks and showers. 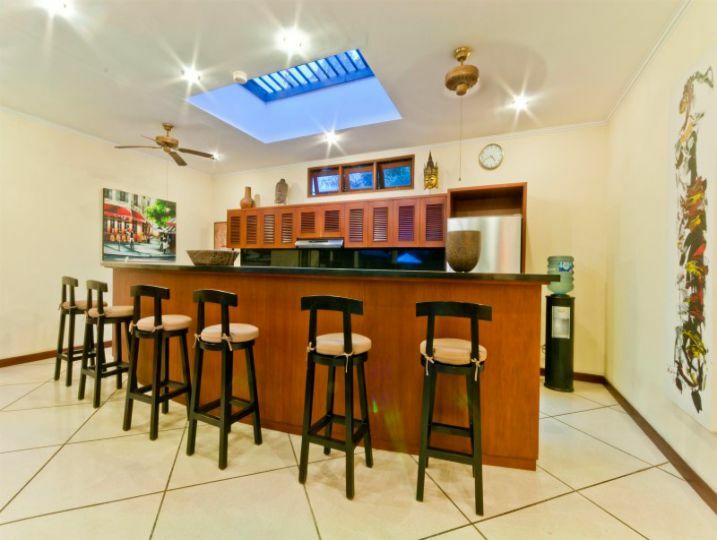 The open-air living area at the centre of the main building houses a modern fitted kitchen with wrap-around breakfast bar, a comfortable seated television lounge and a long dining table with chairs under a pergola roof. 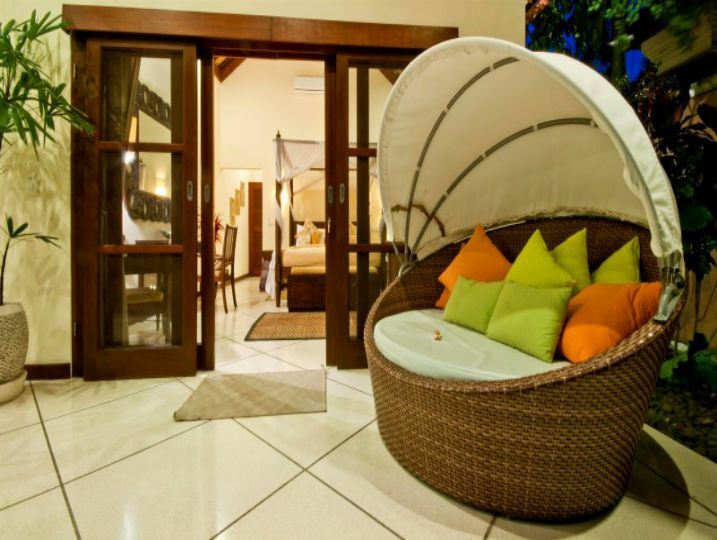 The curvaceous 50sqm swimming pool and bubble spa sit at the centre of it all, with generous decking, lounge chairs, umbrellas and a relaxation pavilion. 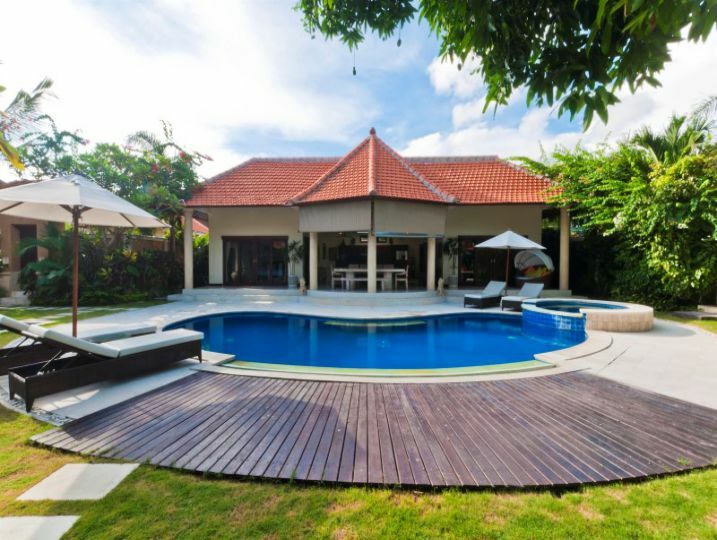 To keep the holiday experiences flowing smoothly from one into another the well considered living arrangements and location are supported by an excellent team of staff at the Villa. 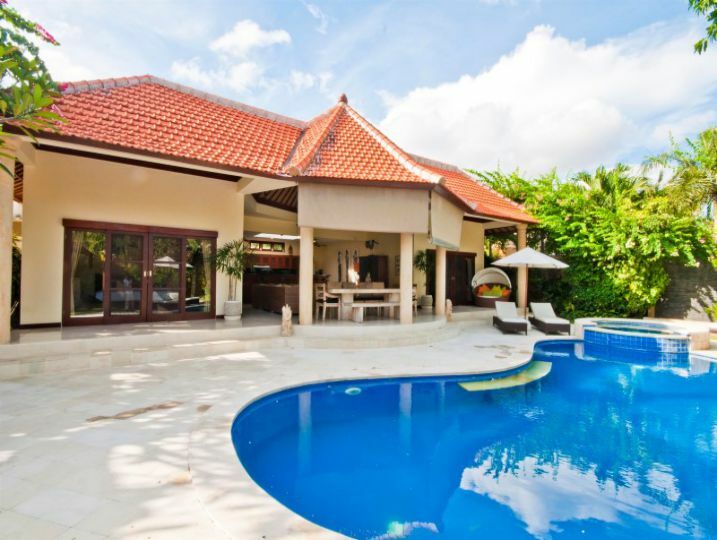 Daily housekeeping, manager, guest assistant, villa attendant, gardener and pool attendant and professional security are all available and happy to help. 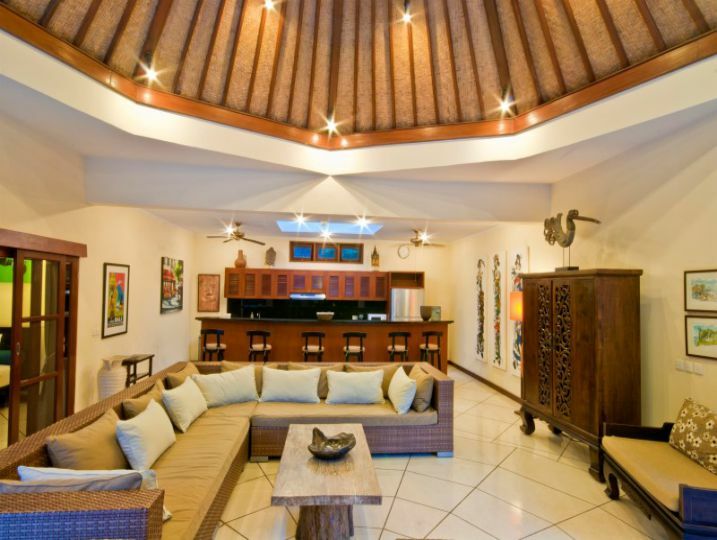 Main Living Area (Open-air living area, Ceiling fan, Television with international channels & DVD player, Music docking station). 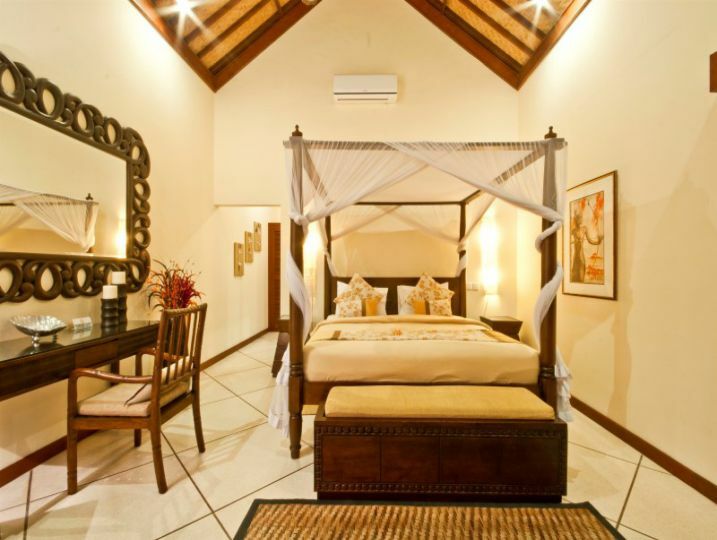 Bedroom 1 (Semi-outdoor ensuite bathroom with bathtub, King size bed, Air-conditioning, Ceiling fan, Television with international channels & DVD player, Toiletries, Wardrobe with safety deposit box, Terrace outside bedroom). 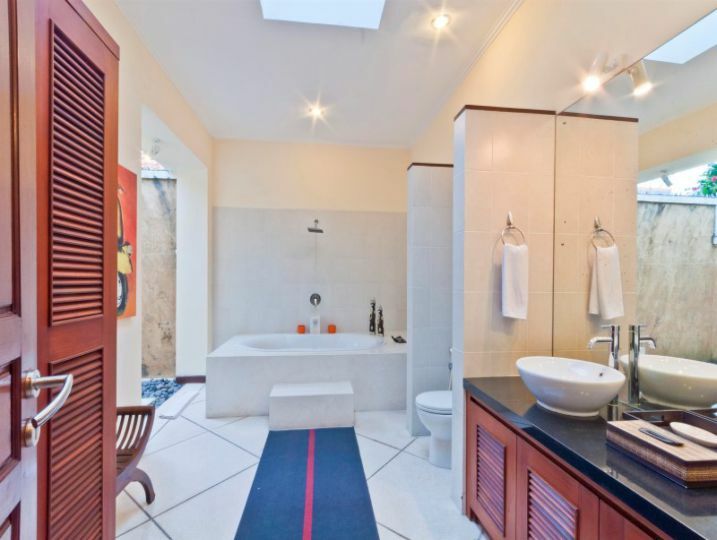 Bedroom 2 (Semi-outdoor ensuite bathroom with bathtub, King size bed with option of two singles (i.e. king-split), Air-conditioning, Ceiling fan, Television with international channels & DVD player, Toiletries, Wardrobe with safety deposit box, Terrace outside bedroom). 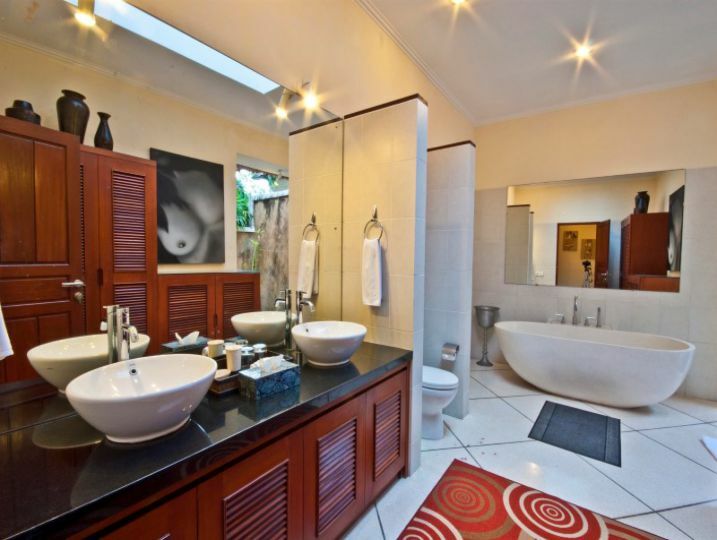 Bedroom 3 (Semi-outdoor ensuite bathroom with bathtub, King size bed with option of two singles (i.e. king-split), Air-conditioning, Ceiling fan, Television with international channels & DVD player, Toiletries, Wardrobe with safety deposit box, Terrace outside bedroom). 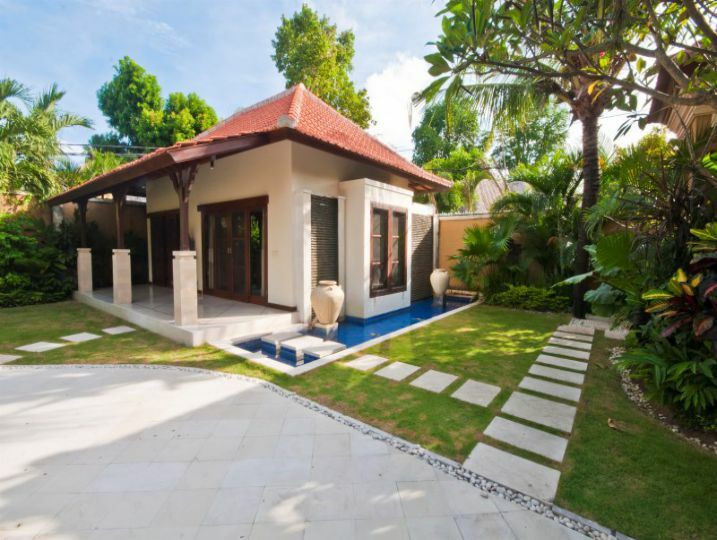 Kitchen and Dining (Open-air kitchen & dining area, Fully equipped, kitchen, Cutlery, chinaware & glassware, Microwave Full-size refrigerator, Dishwasher). 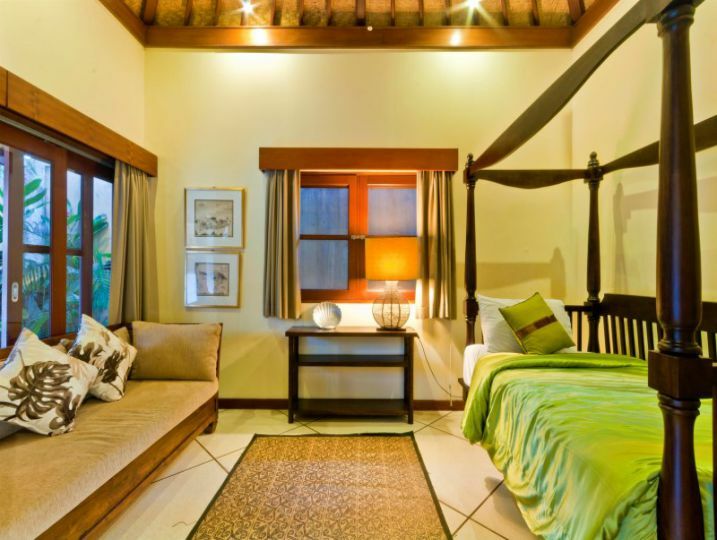 Additional Living Area 1 (Spare room with air-conditioning & ceiling fan, Sofa bed available – additional charge). Miscellaneous (Safety deposit box, Iron & ironing board available, Baby cot & high chair available – charges apply, Back-up power supply (e.g. Generator)). 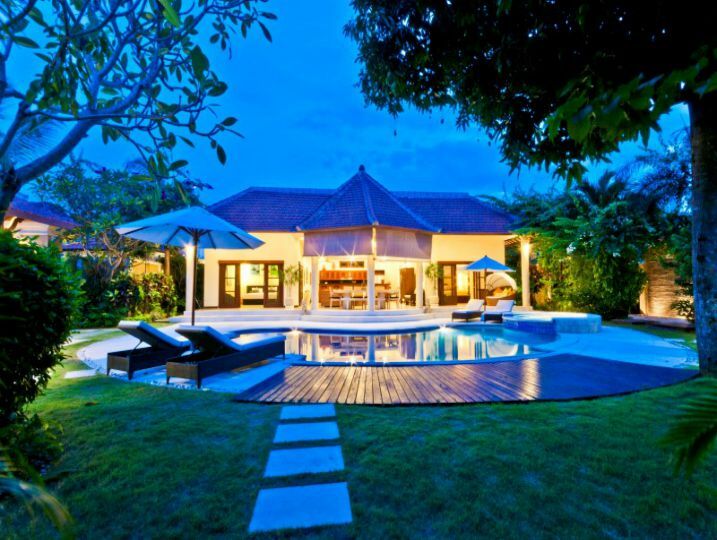 Services Performed by Staff (Villa Manager, Housekeeper, Security Swimming Pool Attendant, Garden Attendant). 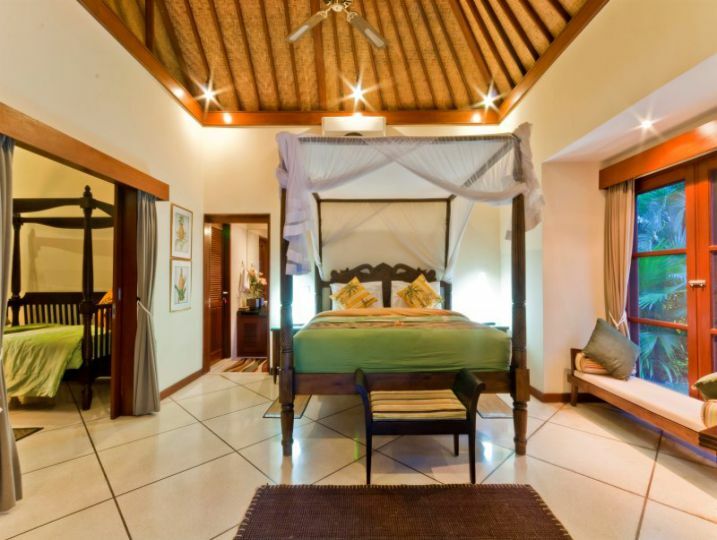 Villa Mango 3 BR is available for selected dates.